My husband and I had our house on the market for year when we decided to change agents and list with Dan Tersigni. He was highly recommended by a casual acquaintance of mine and after interviewing other agents, we decided to go with Dan. We made the right choice! Dan was willing to work with us even though our situation came with very challenging tenants. Dan was up for the challenge and his service exceeded our expectations. Within three months Dan was able to sell our house, during the Christmas season no less. Dan conducts himself in a professional manner and always has his client’s best interests in mind. He is level headed, knowledgeable and we took his good advice on more than one occassion. We highly recommend Dan Tersigni’s services and we look forward to working with him in the future. Dan, Dan, Dan! What a guy! He kept bugging us for years and years to sell our house in Caledon. Finally the day came when we were ready and contacted Dan to handle our listing, needless to say, he did a wonderful job helping us sell our home in just over a month. Thanks Dan, you’re the best! Dan was referred to us, we found him to be very professional and dependable. He was always punctual and well groomed, no complaints at all. He was always up front and knew his stuff. Dan’s persistence over the last fifteen years earned him the opportunity to sit with us when we were ready to put our house on the market. That’s all he needed! He did a great job for us! I’ve known Dan since I was five years old, it was a pleasure doing business with him and all our needs were met. I would definitely recommend him to others. Thank you for your time and help Dan, I really appreciate it. Selling a family home is never an easy decision. When the time is right decisions are that much simpler. As an exclusive listing the stars were aligned that day when Dan approached us with a potential buyer. Within 72 hours the house was sold. Dan’s knowledge and expertise made the sale that much easier. His understanding and helpful nature enabled us and the new family to transition into a new life. When an 11th hour financial institution error left us without funds for our new home, Dan was able to sort out the confusion and secure the necessary funds to close the deal. His exemplary service provided us with assurance and peace of mind. We are grateful to have Dan and his colleagues in our corner. Thank you. Dan instantly made my mother feel understood and that she would be taken care of. Even though other agents made her uncomfortable, Dan did he best and extra to be helpful and reassuring. Many obstacles were placed before him but he came through. Thank you. We are very pleased with your attentiveness with us in selling our home on Dixie Road. It all went very well and we certainly would and have recommended you to others. Wishing you continued success and thank you again! He never gave up. Dan handled the whole process effectively, professionally, and was able to negotiate a price that other realtors said was unattainable. Thanks Dan for your guidance and wisdom. Thank you again for all your expertise in helping the boys find a home. With your long-time experience of all markets, you were able to find the perfect home for them as an investment property. Always professional, polite and mindful. Respectful of our wishes. Helpful to prepare our home for sale. Any wishes imparted from us to Dan always were acted upon immediately. Did not push us to be ready by a certain date but was mindful of our schedule. Always, always pleasant! Dan was highly recommended by friends of ours. He helped guide us in a market that quickly changed. His knowledge and experience paid off for us. Thanks Dan for your expertise. I can’t thank Dan enough for all of his help and guidance selling my commercial property. Dan is a true professional who was always available to answer my questions and to guide me along the way. I wouldn’t hesitate to recommend Dan Tersigni to anyone looking for a honest, reliable and hard working realtor. We have known Dan for several years now and have always had a great experience with him. We have sold and purchased two homes with Dan and could not be happier with the experience. Dan is knowledgeable and honest and always puts his clients first. Honesty is of utmost importance to Dan. He always listens to his clients needs, and helps his clients through the sale process with the greatest integrity. I would definitely recommend Dan for other clients. An excellent experieonce with YourWayOut.ca. Twenty years ago, a young real estate salesman knocked on our door. All that happened was, if we become interested in selling, “keep me in mind”. At that time, we also chit-chatted about the area and possibilities of upgrading. The rest is history. Our house was sold and he found the perfect house for us. I thought that was the end. We were happy, he the same. I find it incredible that our relationship has continued for over twenty years, with montly phone calls just to say “hello”, helping our kids find houses and helping us sell our condo unit. The honesty, caring and integrity displayed has certainly made our business transactions together a real joy. Dan sat down with me and explained and answered my questions that helped me to narrow down my search for my first house. He was able to find me a townhouse that will meet my needs now and in the future. I cannot wait to move in. Thanks Dan! From the moment we started looking for our home, we knew we wanted Dan as our realtor because of the loyalty and honesty Michael previously experienced with him. This time around, with no surprise, Dan exceeded our expectations. When Dan found out Michael was interested in purchasing a home with someone this time, Dan thought it was only fair to get to know me. After developing a list of both of our wants and needs, he helped us with our search, and was determined to find us our perfect home. Soon after, we made a deal! From our process, we don’t just look at Dan as our realtor, but now as a friend. Dan did a great job. He was easy to work with and very conscientious. The sale was fast and easy. Thank you for the excellent service. You were right Dan, you told us you’d take care of everything, and you did. Dan has over 20 yrs experience in the real estate industry, and it shows! Friendly and warm, yet he can get down to business when needed! A true professional. Thanks Dan!! It was a great pleasure working with you again. Thank you for services in selling my house and your assistance in acquiring the rental. As in the past, your insight and advice was terrific and your support throughout the entire process was greatly appreciated. Once I decided it was time to sell my property I gave Dan a call to help me out. Together we decided on a listing price which we both felt was fair and appropriate and from there he went about actively trying to sell the property. He made calls to his contacts and within a week the property was SOLD for a price I was very happy with. Needless to say I was very pleased with the effort Dan put into getting an outcome we were both happy about. I had contact with Dan for some time before I decided to use his services and eve though our business together is completed he continues to keep in contact even if just to say hi and see how things are going. I was (and still continue to be) very impressed with him and wouldn’t hesitate to recommend Dan to anyone looking for a friendly, knowledgeable and professional agent who will get you the results you want. Thanks again Dan! The best call we made when we were looking for a new home in Dufferin County was to Dan Tersigni. His professionalism, drive, and tireless efforts were key to both finding a home and successfully navigating the negotiation process. There are many things that can go wrong when purchasing a new home and you definitely want someone with the expertise of Dan on your side. I honestly believe that had we not had Dan as our real estate agent, we would not have been successful in securing the home we really wanted. Not all real estate agents are alike! If you are looking for an agent who cares as much about your goals as you do, with the experience and real estate business savvy to back it up, do not hesitate to call Dan Tersigni. He’s simply the best. As a first time buyer, one of my requests was that you make it an enjoyable experience and you did just that. We took our time looking and you never rushed me to make a decision. You gave me a chance to get a comfortable feel for becoming a homeowner. Thanks for helping me find a house that has become my home. Selling or buying a home can be an overwhelming experience at the best of times. My situation was during a difficult transition in my life, and having Dan as my agent made everything easier. He is the consummate professional – from his initial pitch to his correspondence – but was always willing to lend a kind and caring ear. He made sure to listen and understand my needs, was relentless in his pursuit for my happiness and VERY patient with this tough customer. His market knowledge combined with his genuine humanity sets him apart from others, which is why I would recommend his services to anyone. Elmer and I know that we can count on you. Your advice and understanding of the market is absolutely amazing. You are a wonderful person who dedicates his time and energy 110%. You are truly a professional in your field and as a person. We have used you twice and whatever our next step will be, you will be there with us. I wouldn’t use anyone else, I trust you completely. Thank you for everything Dan, you are not only my realtor, you have become a dear friend to me. Dan, Rob and I want to thank you for making our house buying and selling so easy. If we ever decide to leave Dixie Rd, we know who to call! Thanks again for all that you’ve done. Dan came prepared to answer our questions about current market value for the sale of our home as well as the purchase of a new home. After making our decision that evening, the actual listing, showings and sale went smoothly with completion of both transactions within 2 weeks. This was the third time Dan has assisted us in selling and purchasing a home. Each time the transactions have been handled quickly and professionally. At no time have we been pressured or hurried into making decisions. Dan handles the negotiations professionally with our interests his primary concern. Dan, thank you for your advice and assistance in selling my house. Selling a home is a somewhat traumatic and emotional experience and I appreciated your professional objectivity in dealing with my concerns. I also appreciated your promptness in responding to our questions and phone calls and being on time for appointments and showings. This is the second property you have sold for me and I wouldn’t hesitate to recommend your real estate services to friends and neighbours. Continued success in your career. Thanks for your hard work! Your knowledge of the market maximized the return on my investment and your advice was critical to our success. You listened and developed a plan based on my needs and showed me a complete professional attitude. You even negotiated the sale for higher than my initial asking price! I would be more than happy to recommend your services to my family and friends as a transaction as big as this requires trust, and you have mine. You sold my house 20 times faster than a previous agent I used before. You really made it look easy. Thanks for taking the time to give me the advice I needed to get my house sold. I was referred to you by my wife’s family and I am very happy I chose you to be my agent. If it wasn’t for you my house would still be for sale. Thanks for everything! Mike and I would like to thank you for all of your efforts on our behalf and achieving the successful sale of our Caledon home. I know we were extremely anxious throughout the time period but you kept us well informed and up-to-date on what was happening in the market. We admired your professional, straightforward attitude along with your willingness to sit and listen to your customers concerns and suggestions. We would certainly recommend your services to anyone buying or selling a home in the Caledon/Brampton area. Working with Dan was a pleasure from the beginning to end. Our home had been listed with another realtor for a year with no success. We listed with Dan and within 30 days our home was sold. Dan made the experience of looking and finding my new home an exciting venture. He was able to zero in very quickly on the type of home I was looking for and made the whole experience very stress free. I would recommend Dan to anyone who is thinking of selling or buying. His knowledge and professionalism throughout the whole process was exceptional. Thank you Dan. Well, we finally did it. We found our house in beautiful Kleinburg. It was a real pleasure working with you Dan, and both Tony and I would like to thank you for your hard work and determination in assisting us locate our new home. Notice, I say home and not house because that is what we found; our new home. You became our friend through this process and really pushed for us when it counted most during the negotiations with the current home owner. I know it was not always easy going in there and representing us for the price we wanted to pay but you did it. And for the price we wanted. How awesome is that? We got the home we really wanted at a price we wanted to pay. We are glad to have met you and are quite happy with our relationship, both on a business and personal level. I will be sure to refer you to friends and colleagues as there is no doubt that the best interests of your clients, ourselves included, are your main concern. We listed previously with no success. We then listed with Dan Tersigni within a few short months, he was able to get our price. Dan went above and beyond the call of duty. He is easy to get along with, knowledgeable, also professional. We are pleased with Dan. My wife and I were amazed at the time, effort and above all friendliness which went into the sale of our home. The standards set were very high indeed but those were surpassed in our estimation. Not only did Dan work very hard for us, he became a true friend, something very hard to define in this modern world when time is of the essence. We recommend Dan to everyone, without hesitation. Dear Dan, It was a pleasure working with you. You gave your 101% to help us finding our new house!! Working with you made us believe that “AGENT” works!! You’ve not only got us a beautiful house but a great deal as well. Our family love and thank you and will definitely, no doubt, will call you again for our investment property needs. I wanted to send a brief note to say thank you and that it was a pleasure working with you to sell our house. Your professionalism, knowledge and support during this time was first rate. Our house was sold quickly and for a price we were happy with. This was a very difficult transition for my mom and you made it as painless as possible and went above and beyond to help in any way possible. I would highly recommend you to anyone. It was a pleasure dealing with you regarding the sale of our property. You were conscientious and thorough in your dealing with us. Thank you for your efforts on our behalf. Thanks so much for all of your help with the purchase of my new home. This is the third time in the past 8 years (Cedar Mills, Palgrave and most recently Mississauga) we have ‘successfully’ worked together both selling and buying my family homes and I wanted to let you know how much I really appreciate the exemplary real estate services you provide. You come prepared to discuss and present the latest area market conditions with clear and concise buy/sell history. You are always patient, listening to and answering all my questions/concerns. Your experience and professionalism certainly made the processes of selling and buying my home(s) both positive and successful. Another thing very important to me, is how considerate you are. You are always flexible and adjusted your schedule for viewing and/or showing the homes around my family’s hectic lifestyle, your caring was and is very much appreciated. Please do stay in touch and continue to send my your quarterly newsletters as they always contain some helpful home maintenance information along with your latest listings and the current market trends (very useful). Although I am planning on staying on in my current location for a few years and may not personally need your services I will continue to recommend you highly to my family and friends considering either buying or selling a home! Once again KUDOS to you Dan (and Cindy)! Dan succeeded in just 20 days where three other realtors tried and failed. Dan is the only realtor that I would use and refer to others. You did a great job marketing our home in Caledon East. Thanks for your effort and expertise. A brief note to express my thanks and appreciation for the professional manner in which you handled the recent sale of my land in Caledon. Naturally one should expect no less from anybody in the business world but regrettably there seems to be less professionalism in the marketplace these days and for this reason alone your courtesy, promptness, attention to detail and the very real interest you have shown in my own transaction is greatly appreciated. I’ll have no hesitation in recommending you to my friends or anybody else and will certainly call upon you again in the future. Once again my thanks and appreciation. Your hard work and professionalism will ensure your continued success. Over discussing selling our house with you, we have become friends. Our conversations were always light hearted and we never once felt that we were being pressured into selling our home. When we did sell and got more than we asked for, we were very happy. We also bought for less than we expected, and are very excited about the new move! Mr. Tersigni was recommended to us by friends, who’ve had the fortunate opportunity to have him represent them as their realtor. With nothing but positive comments from our friends it was decided by my wife and I to choose Mr. Tersigni to act on our behalf as our realtor. This was a decision that proved to be of great success as Mr. Tersigni exceeded our expectations immensely. His professionalism, dedication and willingness to work for our cause was unlimited. He went far beyond the expected norm, which resulted in the success of my wife and I finding a home within a short period of assigned time. His patience, sense of humour, and understanding gave my wife and I a felling of comfort and ease during that expected stressful time of home buying. Dan It’s a time for “New Beginnings” and Jim and I would sincerely like to thank you for all your time, help and support. Dear Dan We appreciate the great job you did for us and you will always be remembered as the “guy who gets the job done”. Dear Dan: Our deepest Thank-You for everything you have done with the sale of our House. Dan! What can I say? It was a pleasant experience we had working together with you to find the right buyer for our property. You were always so helpful in anything we wanted to see or do, as far as looking for our new home went. We always felt you were working one hundred percent for us. Our experience with Dan was both pleasurable and successful. Dan was always prepared, professional and insightful. He had answers to all our questions. His years of experience were of great use to us. We were and continue to be very happy with the outcome of the sale of our property. In addition, we were able to find and purchase a property that we are very excited about. We would recommend Dan as a real estate broker to both family and friends. I had been out pounding the pavement for almost two years looking for the perfect home for my daughter and I. You came highly recommended and you didn’t let me down. Thanks for your patience and hard work. I will definitely send people your way! People say that the process of moving your home or business is one of the most stressful things in life. During such a time of distress, a helping hand and thoughtful advice are always welcomed. I am most grateful for your professional handling of the current situation. Your help is always welcomed and appreciated. We presented you with a challenge when we asked you to sell our house on Airport Road. Two short weeks after our first showing, our house was sold for just over 98% of the listing price. You did it! You also worked with us to help us understand better, the way real estate works. You found us our Dream Home with everything we asked for and more. We can’t say enough about how valuable your real estate knowledge and your knowledge of the Caledon-Bolton area was to us at that time. At a time where real estate has become inundated with agents, it’s difficult to know whom to choose when you’re buying or selling. Your professionalism and knowledge of real estate is very much appreciated. Angela and I would like to take this opportunity to thank-you once again for your outstanding service you provided us with, in both selling and purchasing our home. As you know, moving to a new home can be quite stressful. But thanks to you Dan, much of that stress was alleviated for us. Your professionalism and friendship were very evident and reassuring to us. We look forward to moving into our new home, and please do stop in to say hello. Once again thank-you so very much. We decided to sell our house and family members recommended Dan to us. Dan has many years of experience in this business and his professionalism is outstanding. Dan patiently guided us through the whole process until we found the perfect home for us. Dan helped us buy and sell all within one month. He was very professional, thorough, and easy to work with. At a time as stressful as selling a house can be, Dan’s great sense of humour and easy going nature made the whole process a bit easier to get through. My experience with Dan was very rewarding and educational. He was attentive to the details which were important to me and showed me all the options that were available to me, options I would have overlooked myself! Because of this I’m in a much better financial situation. He worked diligently from the start and results came quickly. When it came time for a decision I felt confident knowing it was the best decision possible – I was better educated! Very knowledgeable. Very pleasant and professional service. Forthright with both professional and personal opinions which greatly help in making decisions. Would highly recommend you to any family or friends. We appreciated very much your efforts and success in selling our land in Caledon. For the past six months, we have been renovating the house to get it ready for sale. We know your enthusiastic dedication and are confident in your selling skills. We will stay in touch with you. I listed my home on two separate occasions with different realtors and tried to sell privately with no success. I then turned to Dan for help and in 9 days we had an offer and it was sold. Actions speak louder than words. I would recommend Dan without hesitation. Thank you very much in the sale of our house. Highway 9 is not an easy sell, but through your continuous effort it happened. You were always there for us with answers to our questions. You are always on top of things. As you know, I have already recommended you to others. Also a special thank you to Cindy. you are the one never seen, but we know and appreciate the terrific job you do. Thank you both! Thank you also Dan for placing my name on your Connections list. It’s greatly appreciated. Dear Mr. Tersigni John and myself were very pleased with your service. The time and effort you put into helping us were greatly appreciated. You met all of our goals. There is only one way to describe Dan Tersigni. He is great at what he does. He is upfront, keeps you up to date on what has happened, gives you suggestions. He is “THOROUGH”. Frank and I have known Dan a long time. He sold our first home and is selling our second. He is not only our Realtor but he also became our Friend. After 20 years my husband and I decided to sell our home and purchase another one, our real estate agent was Dan Tersigni. It was a big step for us but our real estate agent was great. We had many requirements for our new home but with Dan’s patience and perseverance we managed to find the home we wanted. Buying and selling a home can be quite stressful but with the help and guidance of our agent we found the house we wanted within a short period of time. I found Dan a pleasure to work with, and would highly recommend him. His experience in the Real Estate business complete with his sound advice and competitive spirit made him a joy to work with. While we would have enjoyed working with him a little longer; the sale of our home (after just 4 days) severed our professional relationship . . . we remain good friends today. Dan’s results confirm the heading on our homes’ “fact sheet” . . . here today, gone tomorrow! 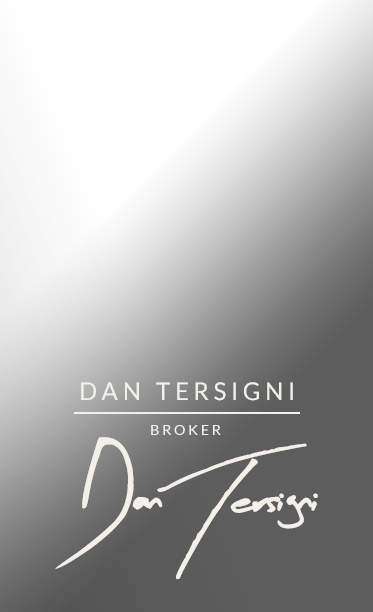 We feel very fortunate to have Dan Tersigni for our Real Estate Broker. Our experience in buying and selling a home was made easier with Dan’s hard work, we felt Dan was not just selling a house but looking after our interests. 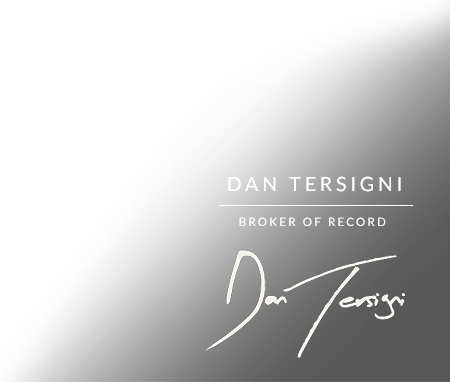 In a word Dan Tersigni is a “professional” and certainly our real estate for life. I found Dan to be extremely professional and helpful. He was always ready to answer my questions and always had time to talk to me. He took a lot of the stress out of a very stressful time. I highly recommend his services!! You’re a great person as well as an excellent realtor. I guess, in trying to sum up my overall experience with you, I can honestly say that you are the most consistent person I have met in a long while, your dedication through continuous follow up is impressive. I would be pleased to have you use my name as a reference should it be required. We met Dan many years ago while in on one of his routine sales calls. It appeared to us right away that this man was very confident about his field and had a willingness to share his knowledge base with us. Dan was completely committed to selling our home on our terms, getting complete market value, and doing so in a very short period. If in the future we need to buy or sell a property, it is with no doubt that “DAN would be the Man”! We have lived in the Brampton area for 30 years. We have sold and bought twice with Dan Tersigni of RE/MAX. He patiently guided us through the whole process and had our home sold for 98% of the asking price, within 2 weeks. If you are thinking about selling your home we highly recommend you call Dan. Our experience with you selling our home in Caledon East was professional and pleasant. We’ll certainly tell others. Our real estate experience with Dan Tersigni was wonderful! Not only was Dan very informative, as this was our first home purchase, he made us feel very comfortable. We know not to hesitate to call Dan, as he is very happy to answer any questions we have. We would recommend Dan to anyone looking for a realtor. We know he will work just as hard for them, as he did for us. After having worked with a number of realtors – I can honestly say the only one I will ever use from now on is Dan Tersigni – a professionals’ professional – and a joy to work with. We are writing to express our appreciation for the manner in which you conducted the sale of our home. Not only did you offer sound advice on the preparation for sale, but also the timing which led to our house being sold in two days! We were amazed at your efficiency and expertise. I have found in my dealings with Dan . . . a thoroughly professional, decent and caring man. I would not hesitate to recommend Dan to my friends and/or relatives . . . as I myself will continue to utilize Dan’s talents and knowledge. Dan’s excellence in the past makes him my #1 choice in any real estate dealings in the future.